As the air becomes colder & the school schedule more intense, kids immunity might start limping a little bit, but with Christmas festivities fast approaching, how do you make sure your child remains energetic & well? Recently a wonderful colleague (Charlotte, I mean you my dear . ), who is also a qualified nutritionist, has introduce me to a British Supplement brand called Cytoplan and my children were roped in to test their Nutribears. Cytoplan works alongside the rationale that there is a nutrition gap in the diets of most people by virtue of several factors, like food choices we make, food growing/processing & preparation methods, nutrient content & the ability of our bodies to assimilate the nutrients. Children are growing and developing all the time, so their food needs to sustain them, as well as fuel their body’s growth. On top of that they need to have plenty of sleep, spend time in the fresh air & away from stimulation that comes courtesy of mobiles, iPads, TV & computers, do sports. All those blocks are fundamental to the foundations of a child’s wellbeing. 1) We always use the most bioeffective nutrient sources – most of these are wholefood, made through a unique growth process & the others are part metabolized where this is necessary for some optimum bioefficacy in some nutrient forms. 3) We are wholly owned by a charitable foundation & all our profits go to charities working with nutrition globally. This means we can always do what we believe is right & are not driven by commercial pressures. 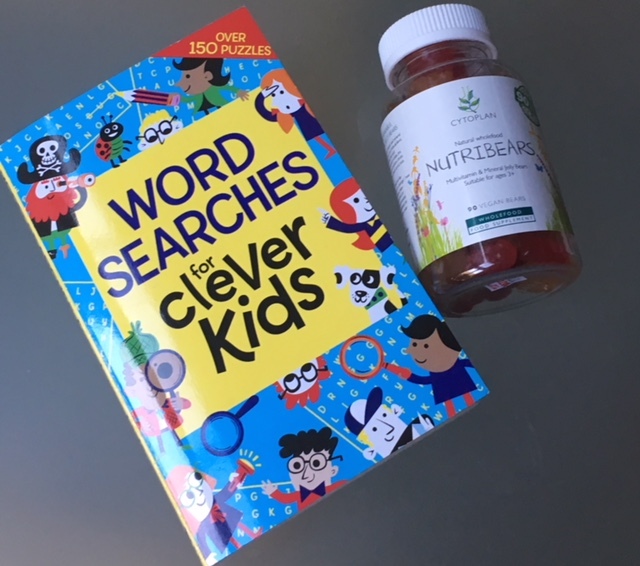 Amanda very kindly sent me a jar of Cytoplan’s Nutribears, a supplement developed for children over the age of 3 years for my kids to try, just as autumn colds & under the eye shadows started making an appearance at schools & on my kids faces. Nutribears are a chewable whole food supplement, especially developed for children aged 3-9, which contain a full spectrum of nutrients that kids need for optimum health, including Vitamins C, D & E, as well as the B-complex vitamins (B6, B12 7 folic acid). Free from GM and suitable for vegetarians, as well as vegans, the supplement is gentle on the tummy & readily absorbed by the kids bodies. In addition the nutrients are in a food base of natural apple pectin, which aids the uptake & use in the body, something that we often don’t consider when choosing not only supplements for children, but ourselves as well. I gave my kids their Nutribears just after their breakfast, before they started their busy school days, full of academic & sports activities. The dose depends on the age and generally 1 bear is matched by 10-15kg of bodyweight. If your child is aged 3-5 years, then it is one bear a day. For 6-8 it is two bears and for 9-12 it is three. List of Ingredients: multi vitamin and mineral premix (which provides: vitamin A palmitate, ascorbic acid, cholecalciferol, di-alpha tocopheryl acetate, pyridoxine hydrochloride, folic acid, cyanacobalamin, biotin, calcium-d-pantothenate, potassium iodide, zinc citrate, choline bitartrate and inostol). Now, to the interesting part of kids ‘testing’ Nutribears. When the jar arrived in early October, I explained the idea & reasons behind this supplement. Both of my kids volunteered their services, but within a few days my eldest started pulling faces and saying that he didn’t like them. As there are red & yellow bears, we made a deal that he will stick with one colour for a few days & he grudgingly agreed. His sister tried to ‘jeopardise’ our deal, by trying to grab one of each coloured bears in the morning, but my all-seeing eyes made sure to alert my vocal cords on practically each occasion…When the jar was finished (there are 90 bears in one jar), my son said he won’t be taking them again. He didn’t like their taste and as he isn’t a big fan of cuteness or Gummy Bears, I know better then argue with him. After all, he shared his opinion & I fully respect it. Supplements that kids take, even with all their goodness, need to form some pleasant habits for the children going forward and if he doesn’t like one, I am sure to look for alternatives until I succeed. For the record, Unbelievable Bee Prepared Immune Formula & BareBiology have full thumbs up from him and are well suited for older kids. My daughter, on the other hand, was on my case to order her another jar, until it arrived much to her delight of individual ownership of it .) Now she ‘lays’ out the bears before breakfast by her plate & makes sure she hoovers them before putting her shoes & coat on. She seems happy & well in herself, so I am keeping my fingers crossed that Nutribears will help to keep her immunity, alongside the lifestyle factors that I mentioned above, on top form throughout those dark & cold autumn & winter months that lie ahead. One of my roles as a mother is to teach my children good habits, so talking to them about health, beauty, wellbeing, social aspects of society, relationships & so much more are important to me. I get to listen to them & learn too and seeing how rapidly children learn now, I can say that they already know things that I don’t ( a great incentive for me not to rest on my laurels and try to keep up with the pace of learning!). At the other spectre, there is plenty of knowledge that I have, which is important for me to share with them. Discussing food and supplements makes them reflect and understand that our bodies are complicated and that if we don’t look after them, they can break down. None of us are guaranteed good health now or in the future, but our lifestyles play a big part in it and that’s why I think it is important to talk about food & drink & make kids aware from early on the importance of seasonality & variety that we need to consume daily in order to be well in ourselves. Choosing the right supplements isn’t easy for me, as I don’t have nutritional, scientific or medical background, but I do my research before committing to this or that supplement and don’t take things just because social media or press tells me too. Form an opinion based on knowledge and teach your children to do the same – that way you will have yet another thin in common going forward as a family.